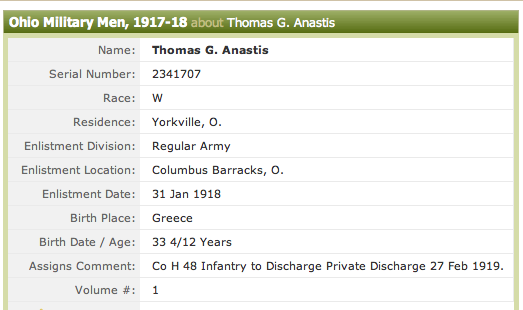 Ancestry.com has a database online that is titled - Ohio Military Men, 1917-1918 which has over 1,300 men who are listing Greece as their place of birth. Among the bloodiest and largest armed conflicts in the modern age, World War One, although primarily a European war, involved United States military units from 1917 to 1918. This database is a massive collection of military records for men who served in the war from Ohio. Originally compiled in 1926, it provides the names for men who served in the army, navy, and marines. In addition to providing the individual's name, it reveals city of residence, unit of service, birth date or age, and other helpful facts. It also contains the location and date of enlistment and discharge information. The names of over 263,000 men are included in the collection. For researchers of Ohio ancestors who may have served in the "Great War," this can be an informative database.